[In French] The Sahel has been at the centre of international and regional efforts to solve multiple crises that affect the region – the lack of human security, terrorism threats, governance failures and food insecurity. Joshua Massarenti of Afroline interviews ECDPM’s Damien Helly on his assessment of the policies implemented by the international community to assist the countries concerned to address these urgent issues. His comments are based on a recent briefing from ECDPM and ISS Dakar that looks at the coordination of strategies between institutional partners involved in the Sahel. Helly sets out a number of key questions about the capabilities and conditions (technical, human, social, cultural, symbolic, logistical) to implement development commitments. Significant funds have been promised to the Sahel, but we now must find the means and the operators that will translate these commitments into concrete interventions that have an impact and make sense to the people of the Sahel. The negotiations for the African Continental Free Trade Area (CFTA) will be launched next weekend at the African Union Summit. The original idea was that it should build on the results of the African Tripartite Free Trade Area (TFTA). But Gerhard Erasmus of the Tralac Trade Law Centre argues that if the CFTA follows the TFTA, there are inherent challenges in reaching agreement on sensitive issues, finalising tariff offers, and adopting rules of origin. This is because the TFTA approach is conservative and protectionist. Instead, negotiators should find the commonalities among the African Regional Economic Communities and use them as the platform from where to start with extending offers. During the next European Council in June, the EU’s Heads of State and Government are expected to mandate the EU High Representative and Vice President of the Commission to launch the process of reviewing the European Security Strategy (ESS), to adapt it to the new global context. The German Development Institute calls for the EU to go beyond a review of the ESS and to develop a new ‘global strategy’ with a strategic vision for the future that redefines Europe’s interests, its global role and its global responsibilities in the twenty-first century, secures European influence in the world and guides its contribution to global public goods.The strategy should define how different areas of EU external action, such as foreign and security policy, trade, climate and development policy, can contribute to tackle global challenges. This is largely in line with the European Think Tanks Group’s report Our Collective Interest: Why Europe’s problems need global solutions and global problems need European action calling for a joined-up EU approach to external challenges. With only six months left, the 2015 UN Climate Change Conference in Paris (COP21) is fast approaching. Despite promising progress in recent years, the negotiations of a new agreement to fight climate change still face many hurdles. Europe has remained at the forefront of these negotiations, but a changing global context, and the European Union’s own limitations, have diminished its leadership. At the same time, Africa is an increasingly influential actor. Climate change is officially on the priority list of joint actions between Africa and the EU. However, diverging views of African and EU actors and internal divisions render the dialogue ineffective. 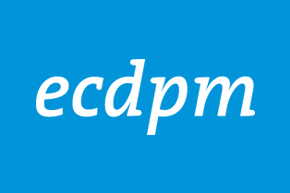 This new ECDPM Discussion Paper argues that a broader and deeper dialogue on climate change between Africa and the EU could offer solutions and compromises that break some of the deadlocks in the UN negotiations in Paris and in the post-2015 period.